Barry to win the $25,000 Burlingame Futures. Top-seeded Ruben Bemelmans of Belgium routed second-seeded Sam Barry of Ireland 6-1, 6-2 on Sunday to win the $25,000 Broadway Tennis Center Men's Futures in the San Francisco suburb of Burlingame. Aside from his 2-6, 7-6 (0), 6-1 victory over sixth-seeded Sebastian Fanselow of Germany in the quarterfinals, the 28-year-old Bemelmans, ranked No. 216, lost no more than five games in a match in the indoor routnament. Last year, Bemelmans reached a career-high No. 84 in the world and helped Belgium advance to the Davis Cup final. He lost to Andy Murray of Great Britain in host Belgium's 3-1 loss in the final. Bemelmans qualified for Wimbledon for the third time this year and lost 8-6 in the fifth set to fellow left-hander Thomaz Bellucci of Brazil in the first round. Bemelmans advanced to the second round at Wimbledon in 2012. The top seeds also won the Burlingame doubles title. Ruben Gonzales of the Philippines and Ruan Roelofse of South Africa beat third-seeded Barry and Peter Kobelt, 6-foot-7 (2.01 meters) from Columbus, Ohio, and Tel Aviv, 6-4, 6-4 on Friday. Here are the complete Burlingame singles and doubles draws. Sam Barry has survived a harrowing road to the final of the $25,000 Broadway Tennis Center Men's Futures. Not only has the second-seeded Irishman needed three sets in all four of his matches, the first three encounters went to 6-4 or 7-5 in the third set, and he came within a tiebreaker of losing in straight sets in the semifinals. Barry, ranked No. 291, subdued unseeded American Mico Santiago 2-6, 7-6 (4), 6-2 on Saturday in Burlingame, near San Francisco International Airport. Barry, 24, is scheduled to face top-seeded Ruben Bemelmans of Belgium for the first time today at noon. Bemelmans, ranked No. 216 after reaching a career-high No. 84 last year in September, outclassed fourth-seeded Raymond Sarmiento, a former USC All-American from Los Angeles, 6-2, 6-3. Bemelmans has had only one tough match in the tournament, a quarterfinal with virtually the same score as Barry's semifinal. Bemelmans, 28, beat sixth-seeded Sebastian Fanselow of Germany 2-6, 7-6 (0), 6-1. Bemelmans qualified for Wimbledon for the third time this year and lost 8-6 in the fifth set to fellow left-hander Thomaz Bellucci of Brazil in the first round. Bemelmans reached the second round at Wimbledon in 2012. He lost to Andy Murray of Great Britain in host Belgium's 3-1 loss in the Davis Cup final last November. Here are the Burlingame singles and doubles draws. Unseeded American Mico Santiago defeated wild card Andre Goransson, a Cal senior from Sweden, 6-3, 6-7 (1), 6-1 today in the quarterfinals of the $25,000 Broadway Tennis Center Men's Futures in Burlingame. Goransson was the runner-up in last week's $25,000 Berkeley Futures on his home courts. Santiago is scheduled to face No. 2 seed Sam Barry of Ireland on Saturday. Barry topped No. 7 Jose Statham of New Zealand 6-4, 4-6, 6-4. In the other semifinal, No. 1 Ruben Bemelmans of Belgium will meet No. 4 Raymond Sarmiento of the United States. Bemelmans, a veteran left-hander ranked No. 216 after reaching a career-high No. 84 last year in September, beat No. 6 Sebastian Fanselow of Germany 2-6, 7-6 (0), 6-1. In the doubles final, No. 1 seeds Ruben Gonzales of the Philippines and Ruan Roelofse of South Africa beat No. 3 Barry and Peter Kobelt of the United States 6-4, 6-4. Sixth-seeded Sebastian Fanselow of Germany beat Marcos Giron of Thousand Oaks in the Los Angeles area 6-4, 6-3 Thursday in the second round of the $25,000 Broadway Tennis Center Men's Futures in Burlingame. Giron, the 2014 NCAA singles champion from UCLA, won last week's $25,000 Berkeley Futures. Fanselow, a 24-year-old former Pepperdine All-American, reached the quarterfinals for the sixth consecutive tournament. He won two $10,000 tourneys in Southern California in three weeks last month. Fanselow, ranked a career-high No. 403, is scheduled to face top-seeded Ruben Bemelmans of Belgium today. Bemelmans, ranked No. 216 after reaching a career-high No. 84 last year in September, trounced Connor Farren from Hillsborough, near Burlingame in the San Francisco Bay Area, 6-0, 6-2. Wild card Andre Goransson, a Cal senior from Sweden, edged Jan Choinski of Germany 6-2, 6-7 (3), 6-4. Goransson, the runner-up last week on his home courts, will meet unseeded American Mico Santiago. Here are the Burlingame singles and doubles draws and today's schedule. Six weeks after turning pro, CiCi Bellis is on the verge of cracking the top 100 in the world. Bellis, a 17-year-old product of Atherton in the San Francisco Bay Area, jumped 10 places to a career-high No. 101 by winning last week's $50,000 indoor tournament in Saguenay, Quebec. The top-seeded Bellis defeated Bianca Andreescu, a 16-year-old Canadian, 6-4, 6-2 for her fifth singles title in a professional tournament and second this year. All of Bellis' previous singles crowns came in $25,000 events in the United States. Bellis did not lose a set in four matches in Saguenay. She won by walkover in the semifinals against fourth-seeded Sachia Vickery of Miramar, Fla.
Andreescu has rebounded strongly after missing six months this year with a stress fracture in her foot. She won her first professional title in a $25,000 tournament in Gatineau, Quebec, in August and reached the girls semifinals at the U.S. Open in September. Mike Bryan, 38-year-old former NCAA doubles champion from Stanford -- No. 5 in doubles (+1), unranked in singles. John Paul Fruttero, 35-year-old former Cal All-American -- No. 391 in doubles (-59). Ryan Haviland, 35-year-old former Stanford All-American -- No. 703 in singles (+6). John Lamble, 24-year-old Saratoga resident and former Santa Clara star -- No. 699 in doubles (-63), No. 807 in singles (-4). Scott Lipsky, 35-year-old former Stanford All-American -- No. 47 in doubles (-1). Mackenzie McDonald, 21-year-old resident of Piedmont in San Francisco Bay Area -- Career-high No. 338 in singles (+4), career-high No. 333 in doubles (+6). Dennis Novikov, 22-year-old resident of Milpitas in San Francisco Bay Area -- No. 157 in singles (-10), No. 161 in doubles (+5). Sam Querrey, 29-year-old San Francisco native -- No. 29 in singles (no change), No. 99 in doubles (+3). Kristie Ahn, 24-year-old former Stanford All-American -- No. 232 in singles (-2), No. 420 in doubles (-39). Raquel Atawo (formerly Kops-Jones), 33-year-old San Jose resident and 2003 NCAA doubles champion from Cal -- No. 21 in doubles (-1). CiCi Bellis, 17-year-old product of Atherton in San Francisco Bay Area -- Career-high No. 101 in singles (+10), No. 253 in doubles (-5). Alexandra Facey, 23-year-old product of Cameron Park in Sacramento area -- No. 742 in doubles (-3). Kat Facey, 23-year-old product of Cameron Park in Sacramento area -- No. 742 in doubles (-3). Nicole Gibbs, 23-year-old former NCAA singles and doubles champion from Stanford -- No. 75 in singles (-1), No. 127 in doubles (-1). Michaela Gordon, 17-year-old resident of Saratoga in San Francisco Bay Area -- No. 663 in doubles (-44), No. 751 in singles (+3). Maegan Manasse, 21-year-old Cal senior -- No. 616 in doubles (+2). Maria Sanchez, 26-year-old Modesto product -- No. 58 in doubles (+2), No. 317 in singles (-13). Sloane Stephens, 23-year-old Fresno product -- No. 36 in singles (no change), No. 886 in doubles (-2). Karina Vyrlan, 18-year-old Sacramentan -- No. 963 in doubles (-5). Carol Zhao, 21-year-old former Stanford star -- No. 288 in doubles (+5), No. 406 in singles (-40). WTA Finals, round robin, 2 a.m. and 2 p.m.
WTA Finals, Basel (men) and Vienna (men), 4 a.m. and 5 p.m.
WTA Finals (women's doubles), 10:30 p.m.
WTA Finals, round robin, 1 a.m. and 2 p.m.
WTA Finals, semifinals, 1 a.m.
WTA Finals, Basel (men) and Vienna (men), 5 a.m., 1 p.m. and 9 p.m.
WTA Finals (women's doubles), 10:30 a.m.
WTA Finals (women's doubles), 1 a.m.
WTA Finals, Basel (men) and Vienna (men), 5 p.m. Through Sunday -- WTA Finals, Singapore. 2015 champions: Agnieszka Radwanska, Martina Hingis/Sania Mirza. Through Sunday -- $25,000 Burlingame Futures, Broadway Tennis Center, Burlingame, Calif.
Nov. 3-6 -- National Indoor Intercollegiate Championships, USTA Billie Jean King National Tennis Center, Flushing, N.Y.
Nov. 12-13 -- Fed Cup final, Czech Republic at France. Nov. 13-20 -- ATP World Tour Finals, London. 2015 champions: Novak Djokovic, Jean-Julien Rojer/Horia Tecau. Nov. 25-27 -- Davis Cup final, Argentina at Croatia. Former Sacramento State star Clarisse Baca has been named the acting coach of the Hornets women. In each of Baca's four years as a player at Sac State (2009-12), the Hornets won the Big Sky Conference regular-season and tournament championship and lost in the first round of the NCAA Tournament. A native of Chihuahua, Mexico, Baca was named to the all-Big Sky first team three times after earning second-team honors as a freshman. She was the team captain for three years and helped Sac State earn a top-30 national ranking while playing No. 4 singles and No. 2 doubles. Baca went undefeated in Big Sky dual matches and was part of Sac State's 112-match unbeaten streak in league play spanning almost 13 years. She had coached juniors since graduating in 2012. Baca replaces Dima Hrynashka, who took a leave of absence for personal reasons, Sac State director of tennis Bill Campbell said today. Campbell added that Hrynashka, who was not available for comment, likely will miss the fall and spring seasons and then decide whether to return. Sac State's news release on Oct. 6 announcing the coaching change did not mention Hrynashka's name. Hrynashka, a Belarus native, has gone 168-96 (.636) overall and 85-4 (.955) in Big Sky play in 10 seasons as the Sac State women's coach. The Hornets won their 13th consecutive Big Sky tournament title in 2014 but lost in the final last year and in the semifinals in April. Hrynashka has won five Big Sky Coach of the Year awards (2008-11 and 2013). Unseeded Marcos Giron of Thousand Oaks in the Los Angeles area outlasted wild card Andre Goransson of Sweden 5-7, 7-6 (5), 6-4 today to win the $25,000 Berkeley Futures at the Hellman Tennis Complex. Goransson, a Cal senior, was playing on his home courts. The 23-year-old Giron, who missed the first 8 1/2 months of this year with an injury, won his fourth Futures singles title and first since 2014. He has never won a Challenger title. Listed at only 5-foot-11 (1.80 meters) and 165 pounds (75 kilograms), Giron reached the quarterfinals of the $100,000 Sacramento Challenger as a qualifier last October. The following month, he beat then-No. 74 John Millman of Australia en route to the quarterfinals of the $50,000 Canberra (Australia) Challenger. Giron turned pro after winning the 2014 NCAA singles title as a UCLA junior. In Saturday's doubles final, top-seeded Connor Smith and Rhyne Williams, both of Tampa, Fla., beat unseeded Goransson and Sem Verbeek of the Netherlands 6-4, 6-3. Verbeek, a 6-foot-3 (1.91-meter) left-hander, was named the West Coast Conference Player of the Year in April as a Pacific senior. Giron also is entered in next week's $25,000 Broadway Tennis Center Futures in Burlingame, near San Francisco International Airport. The main draw is scheduled to begin Tuesday. Unseeded Marcos Giron of Thousand Oaks in the Los Angeles area surprised top-seeded Ruben Bemelmans of Belgium 1-6, 6-3, 7-5 on Saturday in the semifinals of the $25,000 Berkeley Futures at the Hellman Tennis Complex. Giron, who's listed at only 5-foot-11 (1.80 meters) and 165 pounds (75 kilograms), turned pro after winning the 2014 NCAA singles title as a UCLA junior. He is scheduled to play wild card Andre Goransson of Sweden for the Berkeley crown today at 10 a.m.
Goransson, a Cal senior playing on his home courts, routed sixth-seeded Lucas Gomez of Mexico 6-1, 6-0. Bemelmans, a veteran left-hander, lost to Andy Murray of Great Britain in host Belgium's 3-1 loss in the Davis Cup final last November. Top-seeded Connor Smith and Rhyne Williams, both of Tampa, Fla., won the doubles title, beating unseeded Goransson and Sem Verbeek of the Netherlands 6-4, 6-3. Challenger, soared 202 places to No. 339 in doubles. Mackenzie McDonald's doubles world ranking of No. 339 might not look impressive. But the 21-year-old native of Piedmont in the San Francisco Bay Area turned pro only four months ago, and he was No. 541 last week. McDonald zoomed 202 places to a career high by winning the $100,000 Fairfield (Calif.) Challenger with 31-year-old Brian Baker of Nashville, Tenn., last Saturday. It was the 5-foot-10 (1.78-meter), 145-pound (66-kilogram) McDonald's first Challenger title in singles or doubles. In Futures tournaments, he has won one singles championship and four doubles crowns. Fairfield is only 37.5 miles (60.4 kilometers) from Piedmont. McDonald turned pro in June, forgoing his senior year at UCLA, after becoming the first man in 15 years to sweep the NCAA singles and doubles titles. Matias Boeker of Georgia accomplished the feat in 2001. The last woman to sweep the crowns was Nicole Gibbs of Stanford in 2012. She is now ranked No. 72 in singles. Bob Bryan, 38-year-old former NCAA singles and doubles champion from Stanford -- No. 5 in doubles (+1), unranked in singles. Mike Bryan, 38-year-old former NCAA doubles champion from Stanford -- No. 6 in doubles (+1), unranked in singles. John Paul Fruttero, 35-year-old former Cal All-American -- No. 332 in doubles (+19). Ryan Haviland, 35-year-old former Stanford All-American -- No. 709 in singles (+3). John Lamble, 24-year-old Saratoga resident and former Santa Clara star -- No. 636 in doubles (+1), career-high No. 803 in singles (+4). Scott Lipsky, 35-year-old former Stanford All-American -- No. 46 in doubles (no change). Mackenzie McDonald, 21-year-old resident of Piedmont in San Francisco Bay Area -- No. 342 in singles (no change), career-high No. 339 in doubles (+202). Dennis Novikov, 22-year-old resident of Milpitas in San Francisco Bay Area -- No. 147 in singles (+1), No. 166 in doubles (-3). Sam Querrey, 29-year-old San Francisco native -- No. 29 in singles (no change), No. 101 in doubles (-16). Kristie Ahn, 24-year-old former Stanford All-American -- No. 230 in singles (-1), No. 381 in doubles (-2). Raquel Atawo (formerly Kops-Jones), 33-year-old San Jose resident and 2003 NCAA doubles champion from Cal -- No. 20 in doubles (no change). CiCi Bellis, 17-year-old product of Atherton in San Francisco Bay Area -- No. 111 in singles (no change), No. 248 in doubles (-4). Alexandra Facey, 23-year-old product of Cameron Park in Sacramento area -- No. 739 in doubles (+91). Kat Facey, 23-year-old product of Cameron Park in Sacramento area -- No. 739 in doubles (+91). Nicole Gibbs, 23-year-old former NCAA singles and doubles champion from Stanford -- No. 74 in singles (no change), No. 126 in doubles (+2). Michaela Gordon, 17-year-old resident of Saratoga in San Francisco Bay Area -- No. 619 in doubles (-3), No. 754 in singles (+1). Maegan Manasse, 21-year-old Cal junior -- No. 618 in doubles (-3). Maria Sanchez, 26-year-old Modesto product -- No. 60 in doubles (no change), No. 304 in singles (-4). Sloane Stephens, 23-year-old Fresno product -- No. 36 in singles (no change), No. 884 in doubles (-9). Karina Vyrlan, 18-year-old Sacramentan -- No. 958 in doubles (-12). Carol Zhao, 21-year-old former Stanford star -- No. 293 in doubles (-2), No. 366 in singles (-2). WTA Finals, round robin, 2 a.m.
WTA Finals and Stockholm (men), 4:30 a.m.
Luxembourg (women), Stockholm (men) and Moscow (women), 8:30 a.m. Through Sunday -- $25,000 Berkeley Futures, Hellman Tennis Complex at University of California at Berkeley. Sunday-Oct. 30 -- WTA Finals, Singapore. 2015 champions: Agnieszka Radwanska, Martina Hingis/Sania Mirza. Tuesday-Oct. 30 -- $25,000 Burlingame Futures, Broadway Tennis Center, Burlingame, Calif.
FAIRFIELD, Calif. -- The biggest surprise today wasn't that the sun finally came out long enough for the $100,000 Fairfield Challenger to be completed. Or that Santiago Giraldo won the final after dropping the first set. Or that a UC Davis student got soaked with water after the match in a wacky fundraising stunt. It was that a professional athlete thanked a pesky reporter for helping him. Seven years after launching his impressive career by winning the $50,000 Sacramento Challenger, the second-seeded Giraldo might have revived it with the Fairfield title. The 28-year-old Colombian used his experience to outlast Quentin Halys, 19, of France 4-6, 6-4, 6-2 in the completion of the rain-delayed final at Solano Community College. Afterward, Giraldo told a writer who covered both tournaments that the Fairfield title "means a lot for me. It's been a very complicated year in results because I was working on a lot of stuff inside (my head). But as I told you on the first day, it was not easy here. "It's actually been a complicated week, too, with the rain and then a Monday final against a young guy playing very good in the beginning. So it's very important for me to come close to the top 100 again. It's just a number, but the most important thing is how I feel. You bring me luck -- again. After seven years in Sacramento, I won (a tough match) in the first round and the Challenger, so thank you." Giraldo's lucky ball helped, too. Before his opening-round match against 18-year-old U.S. prospect Michael Mmoh, Giraldo put a tennis ball with a smiley face drawn on it on the chair next to his for the first time in his career "to remember how lucky I am." Giraldo won 6-3, 7-5 after trailing by two service breaks in the second set. He used the ball for the rest of the tournament and plans to continue doing so "forever." Giraldo added $14,400 to his career earnings of more than $4 million. More importantly, he rose 16 places in the world rankings to No. 108. He has finished each of the past six years in the top 70, peaking at No. 28 in September 2014 to become the highest-ranked Colombian in the Open era (1968-present). The first four days of the Fairfield Challenger main draw were dry, though increasingly breezy as a storm approached. Rain pelted Northern California on Friday, wiping out the singles quarterfinals and moving the doubles semifinals indoors 41 miles (66 kilometers) away in San Francisco. Giraldo won two singles matches in straight sets on Saturday to reach the final. But rain returned on Sunday, delaying the start of the match for 4 1/2 hours and then suspending play with Halys leading 3-1, ad-out. The final offered an intriguing contrast. South American vs. European. Veteran vs. teenager. Slim vs. strong build. Consistency vs. power. Fire vs. ice. Giraldo, 6-foot-2 (1.88 meters) and only 166 pounds (75 kilograms), owns career victories over Andy Murray, Marin Cilic, Lleyton Hewitt and Jo-Wilfried Tsonga on clay and Kei Nishikori on a hardcourt. But Giraldo has never advanced past the third round of a Grand Slam tournament or won an ATP singles title in two finals. Fairfield was his 10th Challenger singles crown and second this year. Halys (pronounced Ah-LEECE) reached No. 3 in the world junior singles rankings in March 2014. Later that year in the juniors, he won the French Open doubles title with compatriot Benjamin Bonzi and reached the U.S. Open singles final (losing to Omar Jasika of Australia). This year, the 6-foot-3 (1.91-meter) Halys advanced to the second round of the Australian Open -- losing to Novak Djokovic 6-1, 6-2, 7-6 (3) -- and the French Open. In between, he won the $50,000 Tallahassee (Fla.) Challenger on clay. Halys -- who has not only a big serve and massive forehand but touch -- overpowered Giraldo in the first set. Halys saved two break points to hold for 4-1, but Giraldo won the next three games. Halys then held at love with a service winner, deft backhand drop shot and two aces, and broke Giraldo for the set. It was the last time Giraldo lost his serve in the match. Halys suffered the only break of the second set on a double fault to trail 3-4. He also lost his serve in the opening game of the third set and again to trail 1-4. In the latter game, Halys double-faulted twice in a row for 30-all. Giraldo converted his first match point on an error by Halys. Halys finished with seven aces and seven double-faults with a first-serve percentage of only 46. Giraldo had one ace, committed no double-faults and put in 62 percent of his first serves. During the final, Giraldo often yelled "Vamos!" after hitting a great shot or winning a key point. After lacing a forehand passing shot down the line to set up match point, he said softly, "Si, senor. Muy bien." Halys, meanwhile, offered only one subdued "Allez" during the match. He is similarly stoic and taciturn in interviews, giving the impression he'd rather have a root canal. Halys, who ousted No. 1 seed Frances Tiafoe in the second round, jumped 21 places to No. 149 and collected $8,480. "He is going to be a very good player," Giraldo declared. "He already is a good player. He has good strokes, a good serve, he's young, big (tennis) country. "At the beginning (of the final), he was actually very good. I was just thinking, 'Be there, be there and be solid because you have more experience and you can also be very good. Maybe he will start to miss a little bit.' That's what happened, so I'm happy for that." Giraldo also made two tactical adjustments after the first set. "I just changed maybe a little the return of the second serve of him," he said. "I started (to stand back) a little more to give me more space. Also, I tried to hit deeper with more height on the balls. I was changing a little bit the rhythm for him because he was hitting (hard) at the beginning." Halys was bidding to become the second consecutive teenager to win the Fairfield Challenger after American Taylor Fritz won the inaugural tournament at a nearby club at 18. Ranked No. 694 before winning back-to-back titles in Sacramento and Fairfield last year, Fritz is now No. 70. Halys denied that he got tight on the double faults, averring: "I think I played great all the match, but (Giraldo) was just better than me. There is no excuse today." nailed the bucket with a shot on his fourth attempt. Halys succinctly summarized Giraldo's strengths. "He's serving good, he's playing very good from the baseline, he's moving very good," observed Halys, the doubles runner-up in the $100,000 Tiburon Challenger two weeks ago with Dennis Novikov of Milpitas in the San Francisco Bay Area. "There is no mistake from him. He's not missing too many shots." After the awards ceremony, Giraldo and Halys took turns trying to drench former Solano player Tommy Purcell as part of the "Splash for Sports" campaign. Top fundraisers for the tournament, Solano athletics and underserved area youths are given the -- uh -- privilege of sitting at the foot of a ladder with a bucket of water hinged to the top step. Pro players try to knock over the bucket with a shot. Tournament director Phil Cello fed balls to Giraldo and Halys at one baseline, with the ladder and black bucket, emblazoned with an orange San Francisco Giants logo, on that side of the net. Each finalist missed on three attempts, but Giraldo nailed the bucket on his next try, dousing Purcell. It was an appropriate ending to a wet tournament. Here are the complete singles and doubles draws. Santiago Giraldo and Quentin Halys got on the court for all of 20 minutes on Sunday. Rain delayed the start of their final in the $100,000 Fairfield (Calif.) Challenger for 4 1/2 hours, then suspended it with Hayls leading 3-1, ad-out. The first meeting between the second-seeded Giraldo, a 28-year-old Colombian, and the unseeded Halys, 19, of France is scheduled to resume today at 10 a.m. at Solano Community College. After three days of rain, today's forecast is for partly cloudy weather with a 20 percent chance of precipitation and a high of 70 degrees (21.1 Celsius). Giraldo, who won the $50,000 Sacramento Challenger in 2009, is trying to finish the season in the top 70 for the sixth straight year. Ranked a career-high No. 28 in September 2014, he rose 13 places to No. 111 by reaching the Fairfield final. Halys, who ousted top-seeded Frances Tiafoe in the second round, improved 21 spots to No. 149. He advanced to the second round of this year's Australian Open -- losing to eventual champion Novak Djokovic 6-1, 6-2, 7-6 (3) -- and French Open. Halys is playing in his second Challenger final. He beat Tiafoe in three sets to win the $50,000 tournament in Tallahassee (Fla.) on clay in April. Wild cards Brian Baker, 31, of Nashville, Tenn., and Mackenzie McDonald, a 21-year-old native of Piedmont in the San Francisco Bay Area, won the doubles title on Saturday. Here are the Fairfield singles and doubles draws. Second-seeded Santiago Giraldo and unseeded Quentin Halys each won two matches on Saturday to reach the final of the rain-delayed Fairfield (Calif.) Challenger at Solano Community College. Giraldo, 28, of Colombia beat seventh-seeded Grega Zemlja of Slovenia 6-1, 6-4 in the quarterfinals and Joris De Loore of Belgium 6-3, 6-4 in the semifinals. The 6-foot (1.83-meter) Zemlja (pronounced ZEM-lee-uh) pounded five aces in one game but was broken, live-stream commentator Mike Cation tweeted. Halys (pronounced Ah-LEECE), a 19-year-old Frenchman, topped Maximilian Marterer, a German left-hander, by retirement (left shoulder) after leading 6-0, 0-0. Halys then beat qualifier Brydan Klein of Great Britain 6-2, 6-4. Giraldo and Halys are scheduled to meet for the first time today at 12:30 p.m., but rain could push back the match one or two hours. Giraldo has plummeted from a career-high No. 28 in September 2014 to No. 124. He won the $50,000 Sacramento Challenger in 2009 and has finished each of the past six years in the top 70. Halys, ranked No. 170, ousted top-seeded Frances Tiafoe in the second round. In Saturday's all-American doubles final, wild cards Brian Baker and Mackenzie McDonald outclassed unseeded Sekou Bangoura and Eric Quigley 6-3, 6-4. It was the 31-year-old Baker's second Challenger doubles title in two weeks. He won last week's $100,000 Stockton Challenger with Sam Groth of Australia. Baker has undergone 11 operations (both hips, right elbow, sports hernia and four repairs of his right knee). He lsot in the first round of Olympic singles in Rio de Janeiro in August to Yuichi Sugita of Japan. McDonald, a 21-year-old native of Piedmont in the nearby San Francisco Bay Area, captured his first Challenger title in singles or doubles. In Futures tournaments, he has won one singles championship and four doubles crowns. Here are the updated Fairfield singles and doubles draws and today's schedule. Persistent rain postponed the singles quarterfinals of the $100,000 Fairfield (Calif.) Challenger at Solano Community College on Friday. The doubles semifinals were played indoors 41 miles (66 kilometers) away at the San Francisco Tennis Club. All singles quarterfinals are scheduled for today at 10 a.m. at Solano, followed by the all-American doubles final between Sekou Bangoura and Eric Quigley and wild cards Brian Baker and Mackenzie McDonald not before noon. Weather permitting, the singles semifinals will be played simultaneously Saturday afternoon. More rain is forecast starting between 3 and 5 p.m., and there's a 50 percent chance of rain on Sunday. The singles matchups are No. 2 seed Santiago Giraldo of Colombia against Grega Zemlja of Slovenia, No. 5 Alessandro Giannessi of Italy versus Joris De Loore of Belgium, No. 8 Maximilian Marterer of Germany against Quentin Halys of France, and Tommy Paul of Boca Raton, Fla., versus qualifier Brydan Klein of Great Britain. Halys, who ousted No. 1 seed Frances Tiafoe in the second round, and Paul, last year's French Open boys singles champion, are 19. Giraldo, 28, and Zemlja (pronounced ZEM-lee-uh), 30, will meet for the second time. Zemlja won 6-1, 6-4, 6-1 in the first round of the 2013 French Open. The other quarterfinals will be first-time meetings. Both Giraldo and Zemlja are former top-50 players who have reached the third round of Grand Slam tournaments. Giraldo has plunged from a career-high No. 28 in September 2014 to No. 124. Zemlja has tumbled from a high of No. 43 in July 2013 to No. 161. Baker, 31, seeks his second Challenger doubles title in two weeks. He won last week's $100,000 Stockton Challenger with Sam Groth of Australia. Groth lost in the singles and doubles quarterfinals of the $100,000 Monterrey (Mexico) Challenger this week. He played doubles with former Cal All-American John Paul Fruttero. The 6-foot-4 (1.93-meter), 218-pound (99-kilogram) Groth holds the unofficial record for the world's fastest serve at 163.7 mph (263.4 kph) in the 2012 Busan (South Korea) Challenger. McDonald, a 21-year-old native of Piedmont in the San Francisco Bay Area, turned pro in June after sweeping the NCAA singles and doubles titles as a UCLA junior. FAIRFIELD, Calif. -- Americans dominated the first two weeks of the three-week men's Challenger swing through Northern California. This week, it's the international players' turn. Seven of the eight quarterfinalists in the $100,000 Fairfield Challenger are from outside the United States. 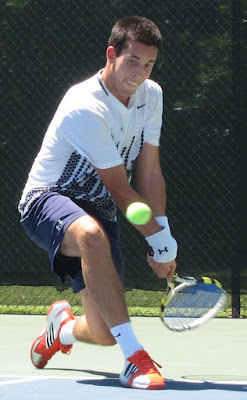 A sweep appeared imminent when 19-year-old Tommy Paul of Boca Raton, Fla., dropped the first set to qualifier Cameron Norrie of Great Britain 6-1 in Thursday's last singles match at Solano Community College. Paul, however, won the last two sets 6-3, 6-4. Six quarterfinalists are European. The other international player is second-seeded Santiago Giraldo of Colombia. "We're coming, moving up the ladder," Belgium's Joris De Loore crowed after upsetting third-seeded Tim Smyczek of Tampa, Fla., on Wednesday. "I have nothing against Americans, but that's the game. You win some, you lose some." Americans took seven quarterfinal spots in the $100,000 Tiburon Challenger two weeks ago and swept the semifinal berths in last week's $100,000 Stockton Challenger. Giraldo, 28, outlasted Brian Baker, 31, of Nashville, Tenn., 6-4, 5-7, 6-4 in a battle of ATP World Tour veterans. Also, seventh-seeded Grega Zemlja of Slovenia dismissed U.S. qualifier Dennis Nevolo 6-2, 6-3. Giraldo has ended the past six years in the top 70, but he has tumbled from a career-high No. 28 in September 2014 to No. 124. Baker has undergone 11 operations (both hips, right elbow, back, sports hernia and four repairs of his right knee). He lost in the first round of the Olympics in Rio de Janeiro in August to Yuichi Sugita of Japan. Giraldo is scheduled to meet the 30-year-old Zemlja, a former top-50 player, today for the second time. Zemlja won 6-1, 6-4, 6-1 in the first round of the 2013 French Open. The other quarterfinal matchups are No. 5 seed Alessandro Giannessi of Italy against De Loore, No. 8 Maximilian Marterer of Germany versus Quentin Halys of France and Paul against qualifier Brydan Klein of Great Britain. All are first-time meetings. Rain is forecast for today, Saturday and Sunday in Fairfield, 41 miles (66 kilometers) northeast of San Francisco. Here are the updated singles and doubles draws and today's schedule. The tournament is being streamed live. FAIRFIELD, Calif. -- Well, it was nice while it lasted. Top-seeded Frances Tiafoe's stay in the top 100 in the world rankings will last one week after his 6-2, 4-6, 7-5 loss to fellow teenager Quentin Halys on Wednesday in the second round of the $100,000 Fairfield Challenger at Solano Community College. Tiafoe, who rose 17 places to No. 100 by winning the $100,000 Stockton Challenger last week, will drop only about three notches when the new rankings are released Monday. But now he's on the verge of having to qualify for Australian Open in January rather than getting straight into the main draw. Tiafoe isn't worried about his slip in the rankings. "That's alright," said the 18-year-old native of Hyattsville, Md., a semifinalist in Fairfield last year. "It's not a big deal. I've just got to keep working and getting better because obviously my goal is to be higher than 80 or 90 in the world. Hopefully I'll be top 20 or top 10 one day, so I'm working toward that." It was a bad day for highly seeded Americans against Europeans. Also, No. 3 Tim Smyczek (pronounced SMEE-check) lost to hard-serving Joris De Loore of Belgium 6-4, 7-6 (5). Tiafoe hopes to make big runs in $50,000 Challengers next week in Las Vegas and the week of Oct. 31 in Charlottesville, Va., then end his season. "I'll play until I feel I'm secure in the top 100 and secure for the Australian Open," said Tiafoe, who led No. 20 seed and then-No. 1 American John Isner two sets to none in the first round of the U.S. Open in August before losing in a fifth-set tiebreaker. "If I have to keep playing until Champaign (Ill., the season-ending Challenger in mid-November), I will, but I'm trying to make it not so many events. "It's been a long season, and I'm really tired. It's definitely tough to bring good tennis if I have to do it a lot of weeks, so I'm trying to focus on the next couple (tournaments)." Tiafoe's loss to Halys (pronounced Ah-LEECE) was hardly shocking. The 19-year-old Frenchman entered the match 4-0 against Tiafoe, having beaten him twice in the juniors (saving one match point) and twice on clay this year. Halys also was fresher after losing to qualifier Brydan Klein of Great Britain in the first round in Stockton. Plus, Tiafoe had an unfavorable schedule in Fairfield. "I mean, it's tough," Tiafoe moaned. "I played Sunday, had one day off and played Tuesday and Wednesday. I was hoping for a Tuesday-Thursday. Obviously, I wasn't so interested in the doubles match (later Wednesday), but luckily we were able to win." Tiafoe, playing half-heartedly at times, and Darian King of Barbados survived a match point and edged qualifiers Michael Kwong of Australia and Matt Seeberger, a 32-year-old San Francisco native and former UC Santa Cruz star, 4-6, 7-5 [10-8] in the opening round. In singles, Tiafoe escaped one match point serving at 4-5 in the third set when Halys, ranked No. 170, netted a low slice backhand. But after Tiafoe held for 5-5, Halys held his serve and broke Tiafoe for the match. From 30-30 in the last game, Tiafoe netted a backhand and had an opportunity for a forehand putaway, but it clipped the tape and went wide. Tiafoe furiously smashed his racket on the court three times. Halys, who reached the second round of the Australian Open and French Open this year, said his "game plan was to be very aggressive because I knew he was very confident from the last few weeks and he's in good shape now. I know him since a very long time and we always have tough matches (except the first one). Today it went my way." The 6-foot-3 (1.91-meter), 166-pound (76-kilogram) Halys pounded 12 aces, committed eight double faults and saved 12 of 14 break points against him. "He has a good serve," Tiafoe observed. "He can hit big at any time. He's pretty erratic. He doesn't really give you much rhythm. He'll miss shots, and you'll be like, 'Wow, it's bad,' and he'll hit some shots where you're like, 'Wow, it's really good.' He's definitely tough to play, and I haven't really found any answers for him yet." De Loore, ranked No. 184, upset a highly seeded American in the early rounds for the second consecutive week. He ousted top-seeded Bjorn Fratangelo in the first round in Stockton before losing to eventual runner-up Noah Rubin, 20, of the United States. Against the 134th-ranked Smyczek, De Loore blasted 13 aces and had only one double fault. He put in 71 percent of his first serves, won 85 percent of the points on his first serve (41 of 48) and saved five of six break points against him. De Loore, who moves well at 6-foot-3 (1.90 meters), also displayed impressive groundstrokes. "If I keep serving like this, every game (opponents) have to be at their best to beat me," said De Loore, who has defeated three top-100 players this year. "The return is one of the points I have to work on, but today I returned good." The key point in the match came at 5-5 in the second-set tiebreaker. Returning Smyczek's second serve, De Loore slugged a forehand cross-court passing shot. De Loore then hammered an ace for the match. "That 5-all point in the tiebreaker -- I was actually getting a weak reply when I could get him jammed to his forehand side -- but that one, he took a rip on, and it panned out for him," said Smyczek, who pounded seven aces despite being only 5-foot-9 (1.75 meters). In Friday's quarterfinals, De Loore will meet No. 5 seed Alessandro Giannessi of Italy, and Halys will play No. 8 Maximilian Marterer of Germany. The other quarterfinals will be determined today. Marterer, a 21-year-old left-hander, withstood 20 aces to beat 6-foot-11 (2.11-meter Reilly Opelka, a 19-year-old American wild card, 3-6, 7-6 (4), 7-5. Opelka was playing in his first tournament since retiring from his second-round qualifying match in the U.S. Open with his sixth stress fracture in one foot or the other in 18 months. "I felt it today," Opelka said. Opelka broke through in Atlanta on the ATP World Tour earlier in August, beating then-No. 28 Kevin Anderson, who's 6-foot-8 (2.03 meters), en route to the semifinals. Rain is forecast for Friday through Sunday in Fairfield.